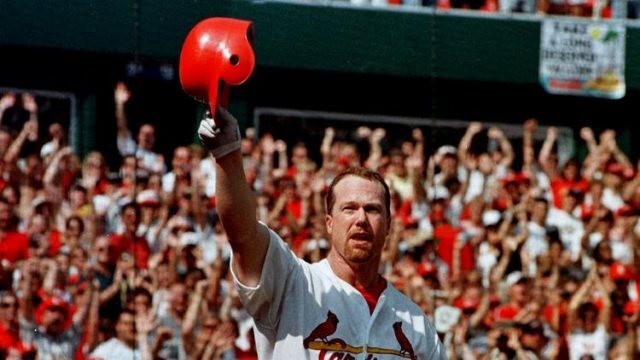 Nightengale: Would McGwire be in Hall of Fame if not for Admitting PED Use? Mark McGwire plops down on a couch in the visiting clubhouse at Busch Stadium, his heart racing, his eyes reddening, talking about the decision heard ’round the world of baseball. If he never did it, perhaps this weekend’s induction into the St. Louis Cardinals’ Hall of Fame wouldn’t be the most significant honor he has received since retiring 16 years ago. If he never did it, perhaps his prospects of making it to the hallowed halls in Cooperstown, N.Y., would have improved, like it has for many of his contemporaries. If he never did it, perhaps he still wouldn’t be answering questions about his dark days. We’re not talking about the moment McGwire decided to use performance-enhancing drugs, gravely wounding a career that included 583 home runs, 12 All-Star seasons, four home run titles, a World Series championship and the most magical night in baseball in the past 40 years. We’re talking about when McGwire decided he needed to come clean, sitting down with Bob Costas on Jan. 12, 2010, and admitting that he used performance-enhancing drugs off and on for about a decade. To this day, he is the only player to appear on a Hall of Fame ballot who has publicly admitted to steroid use. If he had kept quiet, he might have gained more support in Hall of Fame voting before falling of the ballot last year. In 2010, McGwire appeared on 23.7% of ballots cast by eligible members of the Baseball Writers Association of America. A year later, after admitting to steroid use, that number dropped to 19.8% and continued to wane until getting 12.3% in 2016. Meanwhile, other sluggers from McGwire’s era, ones suspected of using PEDs but with no substantial evidence, are gaining ground. Mike Piazza, Jeff Bagwell and Pudge Rodriguez have become members of the Hall of Fame in the last 13 months. Barry Bonds and Roger Clemens, for whom there is far more evidence of PED use, each going to federal court to win not-guilty verdicts on perjury charges, have made significant gains in the past two years, getting 53.8% and 54.1% last year, and now stand a strong chance of making it to Cooperstown. But Sammy Sosa, McGwire’s running partner in that magical home run race of 1998, is headed the other direction, collecting 8.6% last year. If not for McGwire’s admission, would he be viewed differently today? 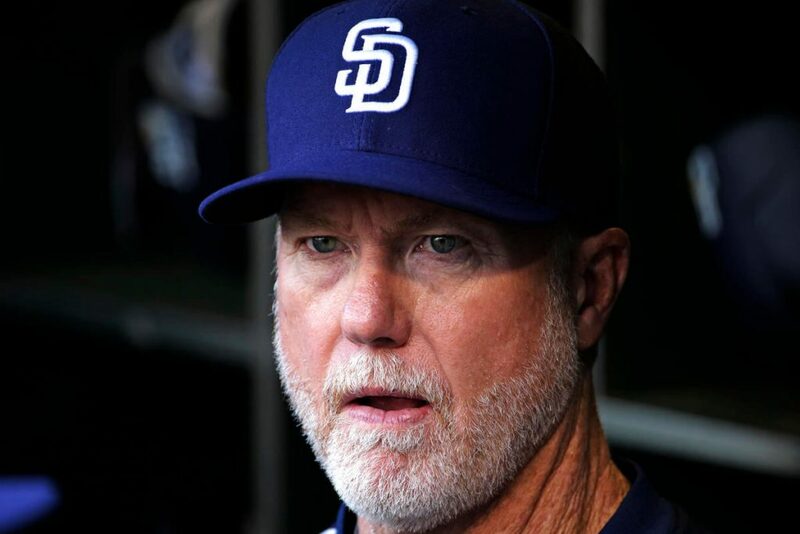 “No regrets, I’ve got no regrets,’’ says McGwire, now the San Diego Padres bench coach. “I don’t know anything about those other guys, but I know what I did. I know what I’ve done. Still, there’s a part of McGwire’s soul that has been ripped away. He knows he belongs in the Hall of Fame. And what happens if Bonds and Clemens reach it? “I hope they do make it, they should,’’ McGwire says. “Barry did a hell of a job. The numbers are there. But you know what, my numbers are there too. McGwire slowly exhales, knowing it’s all out of his control and public sentiment may be cast in stone. “I’m not the type of person who’s going to fight it,” he says. “But you also have to remember there were no rules or regulations about that kind of stuff when I played. That’s the bottom line. If there was testing, McGwire says he would never have used PEDs. He’s not making excuses, but he happened to play in an era when there were teams, trainers and front office personnel who actually encouraged drug use. McGwire homered once every 10 at-bats during his career, which is still the best in major-league history, with a .588 slugging percentage than ranks eighth. And even with the home run rate this season the highest in history, no one is going to come close to McGwire’s 70 homers in 1998, let alone Bonds’ record 73 in 2001. Go ahead and call them tainted totals, with Miami Marlins slugger Giancarlo Stanton saying that if he reaches 62 homers this year, he would become the real single-season home-run king. You won’t get McGwire to agree, but you won’t get him into an argument, either. “I saw that, but what am I going to say?’’ McGwire said. “You know what, that’s obviously his opinion, and I’m extremely happy for him. No injuries this year. And he’s found that hitting slot. It’s why this weekend is so emotional for McGwire and his family, knowing that despite spending just 4½ years in St. Louis, he was voted into the Cardinals’ Hall of Fame. Maybe there will be a day, McGwire says, when Cooperstown will be calling, too. If Bonds and Clemens make it, maybe he’ll be viewed differently. He’s still eligible to be selected by the veterans’ committee, which passed him over last winter in his first year on the Today’s Game ballot. The Baseball Hall of Fame would be the ultimate honor, McGwire says, but he refuses to let it define him. “If it happens, great, but if not, I understand it,’’ McGwire says. “Really, I’m OK with it. Baseball is in my blood.